The Three Burials Of Melquiades Estrada was released in Australia during May 2006, several months after its American release. Western movies are rare if not extinct these days and the last good Western I remember seeing is Unforgiven directed by Clint Eastwood in 1992 … 14 years ago. The film has a typical Western theme of vengeance mixed in with a modern tale of the relations between the townsfolk on both sides of the Mexico/USA border and highlights the difficulties in patrolling a 3000km+ border when people are willing to risk dying in the treacherous terrain along it, in the hope of finding work and a better life for their family in the US. However, moviegoers should note that the pace is pretty slow and there are no all out gunfights or standoffs between gunmen as you would have seen in Unforgiven, the Dollars Trilogy or other older Westerns. The emphasis is on showing the repercussions of a promise made by Pete Perkins [Tommy Lee Jones] to his friend Melquiades Estrada [Julio Cedillo] and depicting the beautiful, but treacherous landscape along the the Texas/Mexico border. The Three Burials of Melquiades Estrada is a study of the emotional, psychological, spiritual and social implications of having an international border running through the middle of a culture. We have used the narrative form of a journey wherein circumstances conspire to compel a hero to leave a mundane place and travel through various other places; some of them dangerous or life-threatening, some of them humorous, some of them mysterious, all of them arduous, until ultimately, he arrives at a good place where he knows who he is and how to gracefully relate to the world around him. It’s a form that’s been used for thousands of years, and it serves us well in this study of social contrasts and the mechanics of faith. A man is shot and quickly buried in the high desert of west Texas. The body is found and reburied in Van Horn’s town cemetery. Pete Perkins [Tommy Lee Jones], a local ranch foreman kidnaps a Border Patrolman [Barry Pepper] and forces him to disinter the body. With his captive in tow and the body tied to a mule Pete undertakes a dangerous and quixotic journey into Mexico. 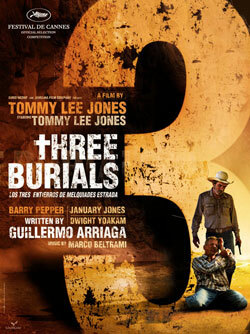 The Three Burials Of Melquiades Estrada was released in DVD form on June 6, 2006. I have been wanting to watch this movie for a long time and I finally saw it last night on SBS. Yes you are right…not your typical western but non the less, I enjoyed it. I must have as I stayed up until midnight when I am usually well in bed by 10!